Use this Hall China 5710AWHA ivory (american white) 10 oz. oval baker dish to bake and serve a variety of appetizers, side dishes, and desserts like spinach artichoke dip, macaroni and cheese, or fruit cobblers in your fine dining establishment. Hall China provides the best heat and cold retention available and is specifically designed to distribute heat uniformly to prevent scorching and burning during service. Beautiful bakeware. We use this in the winter for apple crisps/during the day for mac and cheese and in between for fruit bowls and granola. Its a perfect fit in any kitchen. 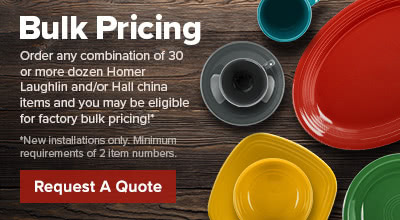 Hall China is sturdy and well made.